I went to a most extraordinary event last Sunday. My friend once interned with a non-profit that uses the arts as a tool to help at-risk youth, and the director of the program gave her comp tickets to the benefit fundraiser. Many of the kids from the program were at the event, some singing, some showing off their artwork, some rapping, and some just enjoying the show. The kids who performed were fantastic, and all of them had fascinating, sometimes startling, stories. But I can tell that doesn’t interest you, so let me give you what you came for…the Broadway performers were OMG fabulous and OLLLDDDD (shimmy shake, shimmy shake)! He did NOT do that in the show. 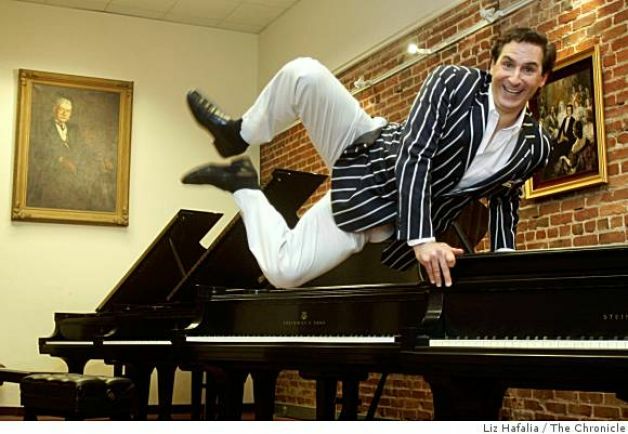 The evening was hosted by Mark Nadler, an ultra-fierce piano man and general Broadway personality who wears his suit jacket inside out with matching socks and doesn’t care who knows! Mark celebrates his birthday each year by holding a fundraiser for the organization, which is pretty fantastic, though a little different than my birthday style (Applebee’s). He likes to sing songs about being a kid and not wanting to practice piano/grow up/have responsibilities. He uses humor and silly facial expressions to get the crowd going. And oh, did he get them going! Speaking of the crowd, I should let you know that the rest of the audience, aside from the kids in the program, were insanely rich AARP cardholders. I’d say 75 was the average age, and$1 million a day was the average income. And their faces were tight. The woman sitting behind my friend had had more plastic surgery than anyone I’d ever seen in real life. She was like the Lion Queen, but older. Now, let’s get on to the performers, because they were FABULOUS (shimmy shake, shimmy shake)! First, I learned something very important, which is that all Broadway and/or cabaret performers are required to walk sideways (step open, cross, open, cross) and smile, when entering and exiting the stage (possibly at all times in life). It was ridiculous. At any point, Kristen Wiig or Maya Rudolph could have walked on, shouting an over-the-top “Good evening!” and I wouldn’t have known the difference. These people were literally characters. I’m not going to give the names of any of the performers, because you probably wouldn’t know them (I didn’t), but I’ll describe a few key players. There was a small brunette in a red dress who was probably about 70. She sang her little song, and everyone clapped politely, then turned around and pulled her shawl (see, old) over her head. When she turned back around, she’d transformed herself into a hunched Yiddish grandma. She did a skit in which she used every Yiddish phrase in the book–at top speed–to talk to her imaginary grandchild who’d decided to become an actor. She killed it. These people could hardly take how funny it was. At some points she began hacking over the words, and I think someone might have had a heart attack. It was unbearably funny! I assume that the majority of the audience was either Jewish or racist. There was also a woman who might have been Aunt Dorothy, but I think she would have told me if she had a performance. She was a 75ish black woman in a sequined dress and black patent leather flats (I think she had circulation problems, but I’m pretty sure you can find sparkly flats). When she opened her mouth, none of us were prepared for the roar that came out. She sounded like a monster bear. Her version of “Lean On Me” was awesome and super scary. I have resolved to be like her when I grow way up. At the end of the show, the kids did a little rap to “Defying Gravity” from Wicked, and the actual woman from Wicked broke it down on the vocals. Everyone from the two hour show sideways-walked out to join in. Somehow they transitioned to another song, and they all belted that one out, as they kids backed away, slightly afraid. It was crazy fun weird time, and I loved it. If there are two things that go strangely together, they are at-risk youth and show tunes. But everyone on that stage seemed so happy. They were having a great time with one another, despite all their differences, and I think seeing that happen year after year is what keeps Marky-Mark churning out the child-themed hits and sporting those wacky outfits.